Easy to use, effective and the price is right. Frontline Plus has been great for our family. Frontline is easy to use and seems very effective. Have to use this product for my Shepherd mis since she is allergic to Vectra. This product works great. My dog doesn't like it, but it works for me. I love using Frontline Plus. i trust it for my little dog. I love that he gets no flees, mites,ticks and worms. This product is easy to use as it is applied to only one spot. This is excellent when applied properly. If not applied directly on skin not effective. Best protection against fleas and ticks at the best price. Ordering Frontline on PetCareRx is so easy and convenient! With 3 furbabies I look for the best deal for their flea control. This product does not deliver on its promises! 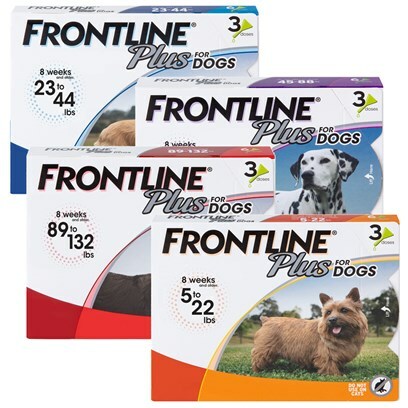 Frontline Plus has been very effective; my dog has had no problems with fleas, ticks, lice or mites.